It’s still Monday somewhere in the world! 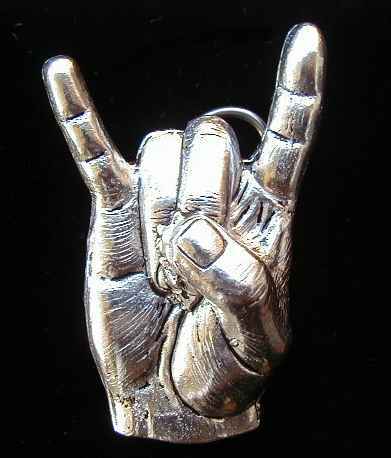 And that means it’s time for the first edition of METAL MONDAYS here at Picture Poetry. Also by far my biggest blog post ever. I’m psyched! 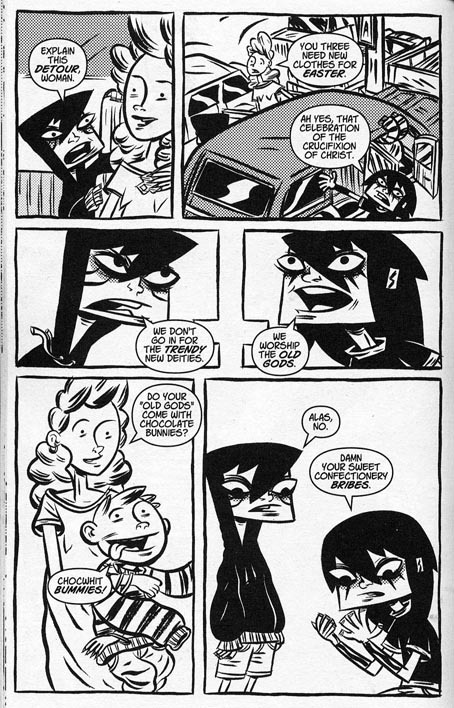 There’s been some discussion lately about the role of visual samples in comics criticism. Let it be known that I am all for it! I’m trying to pass along some observations about the works I read, and if those works happen to be visual, I can hardly expect to communicate my point clearly unless we’re both looking at the same thing. Now then, let’s get to it! 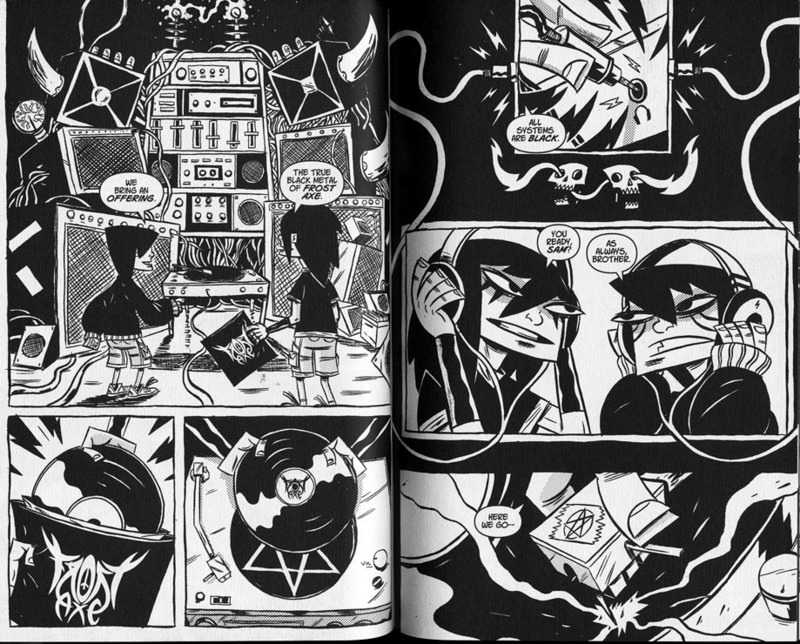 Black Metal is a new graphic novel about, well, black metal. Two reasonable questions might immediately spring to mind: 1) what is black metal? and 2) will this book mean anything to people who don’t know? **BRIEF SIDEBAR**: I wonder how much of this was avoidable. Britpop by its very definition was completely saturated in media coverage and analysis; extreme metal, on the other hand, has been a consistently underground phenomenon with the exception of the church-burnings. 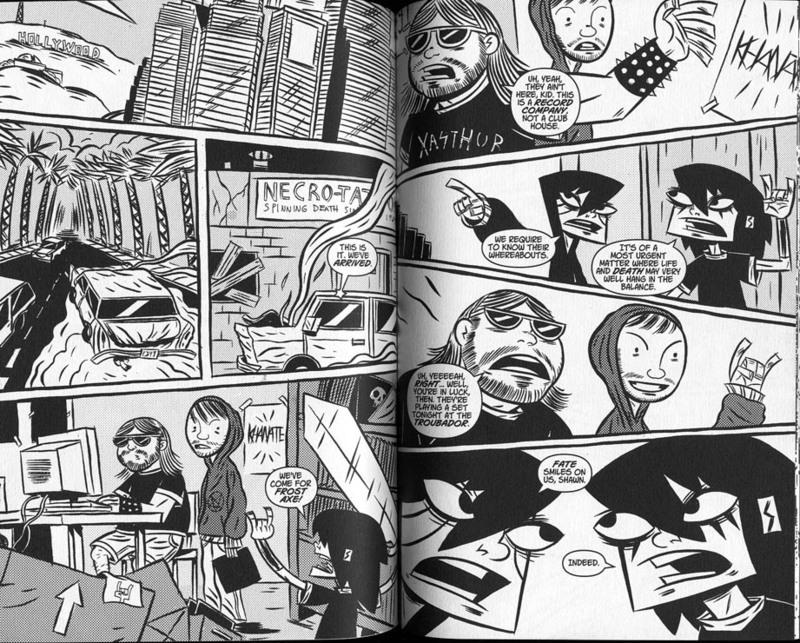 That might make it ironic that a black metal comic is more popularly accessible than a britpop comic, but Spears used the generic tropes of the scene, including a generic fake band (if he’d had the boys meet Darkthrone or Gorgoroth, it would have been completely impenetrable), while Gillen constantly used specific real people and bands, because he felt they were famous enough. In my case at least, they weren’t. for his own reasons [see comments below]. 1) Briefly, black metal is one of the important strands of extreme metal, all of which is characterized by extremely fast tempos, indecipherable vocal delivery, heavily distorted guitars, and deliberately offensive texts. Whereas death metal was developed primarily in Florida and Sweden, black metal is focused in Norway; it’s also more ideological than death metal (the church-burners and white supremacists came from black metal). 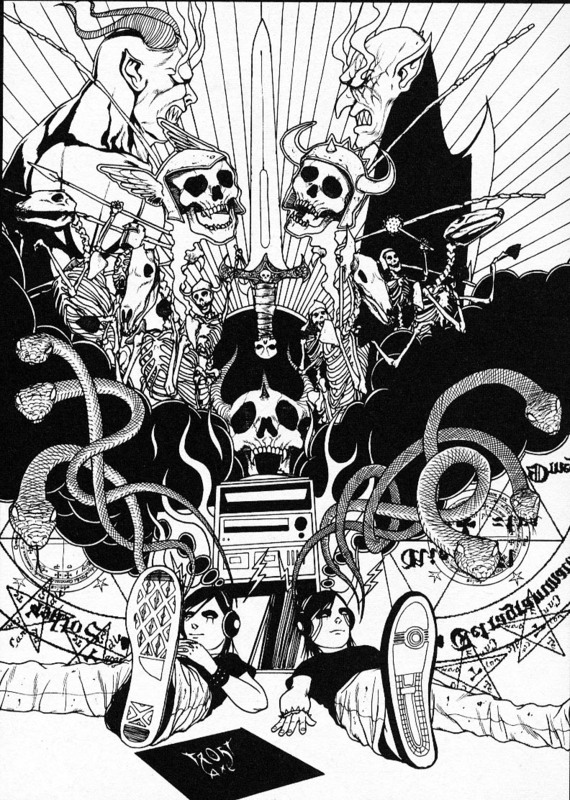 Sonically speaking, black metal favors thin vocal shrieking and high-pitched guitar melodies played as a constant stream of repeated attacks (tremolo picking). Drumming is rarely innovative; generally you just get a straight blast beat underneath the whole thing. A lot of recent black metal has broadened to accept keyboards, and then only gotten more and more lush and ambitious in its orchestration. The early stuff all has legendarily bad production, though. Here is Darkthrone’s video for Transylvanian Hunger (1994), which looks like it was filmed by an idiot wandering in the woods, which is appropriate — it sounds like it was recorded by one too. 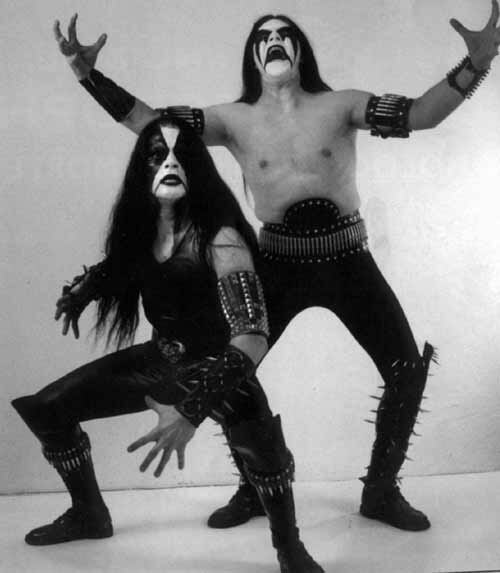 Ideologically, black metal is heavily focused on northern Europe and on Germanic heritage (both physiological and cultural). Lyrics generally position the bands as faithful adherents to “the old gods” who idealize the culture of the pre-Christian North. In extreme cases this includes talk of racial purity and violent revenge against the poison of Judeo-Christianity; in other cases it’s merely a celebration of pagan culture. Oh! And then there’s the corpsepaint. Blah blah blah, pantomime, romanticization of death, absence of compromise or ambiguity, cf Rorschach, superhero morality. As you can see, black metal is also more than a little bit preposterous, and any book that wants to dabble in it must walk a fine line between reverence and mockery. Keep this in mind. 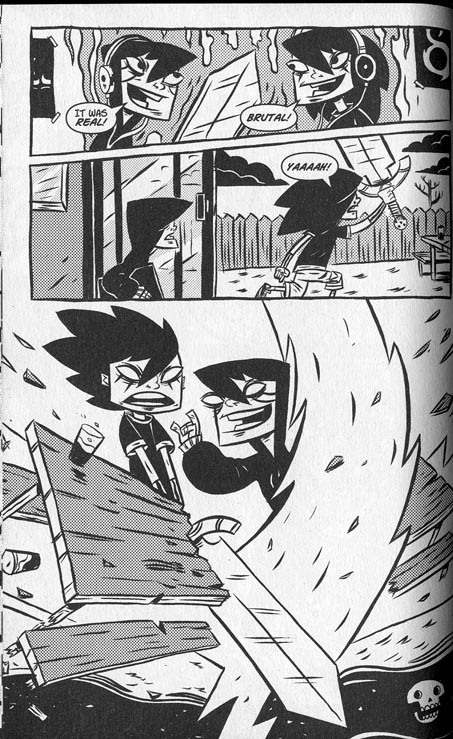 Anyway, the book stars twin brothers Shawn and Sam Stronghand, who find themselves arriving at yet another new high school, having been expelled from all their previous ones. We follow them for a day at school, but nobody really cares about the school scenes (including the creators?) and they’re over quickly. When the boys procure a new LP by the mysterious Frost Axe, the adventure begins. Backwards messages, mystical visions, ancient prophecies, celestial battles, and lots and lots of yelling while in badass poses. 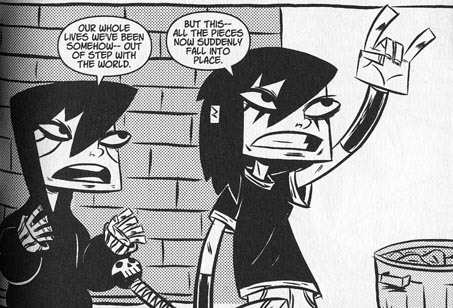 But then “yelling while in badass poses” is quite possibly what comic books are for — at least those published by Oni. Actually, Chuck BB draws pretty distinctive hands across the board — those chunky fingers have a lot of personality to them. I wonder how fair it is to bring in a comparison to Ditko hands (the current generation of comic critics have decided that the true legacy of the famous artist Steve Ditko is the distinctive way he drew characters’ hands: see Douglas Wolk, Andrew Hultkrans, etc). In two lines, Spears nicely summarizes the book: it’s about orphans discovering their identity, outsiders finding their niche/clique, alienated youth becoming socialized (in a way), and prophecies being fulfilled. 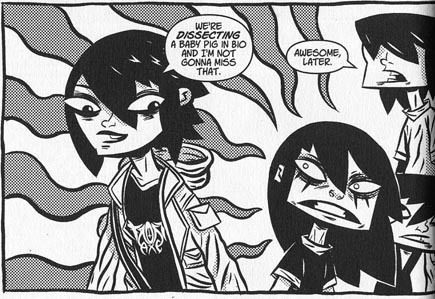 Unfortunately, this panel also summarizes the progression of the book. The early sections are really unstable — the book doesn’t seem to know what kind of story it wants to be; lots of different threads are introduced but some of them seem to disappear abruptly. To be honest, after reading the first third I wasn’t optimistic about the rest. Once the action starts, though, the book really finds its feet and consistently nails scene after scene, to the point that I’m now actively looking forward to the next volume. — is a reference to Emperor‘s most famous song, “I Am the Black Wizards” (1993/4). There’s a panel where Sam calls their classmates “a weak and superstitious lot,” which is pretty close to “a superstitious, cowardly lot,” a famous line from Batman’s origin story. Also, I have halfway convinced myself that the unusual panel layout of this page — a montage depicting our heroes buckling up for a road trip adventure — is a sly reference to the Autobot logo from Transformers. The panel forms an inverted cross, which often symbolizes the rejection of Christianity and has been used by a bunch of metal bands. 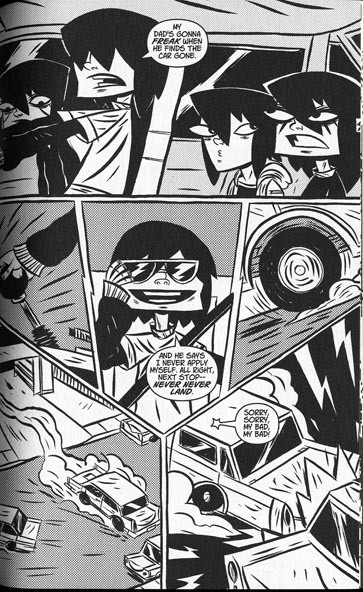 Throughout the book, BB’s layouts are clear and strong and perfectly paced, plus peppered with little tricks and jokes of this sort. The typical hero narrative has the hero receive a magical device along the journey that only is used during the climactic final battle. But Sam and Shawn know better — they know what every kid knows. When destiny offers you a sweet new toy, you immediately go and try it out. This often involves screaming “YAAAAH” and hitting something. Of course the label consists of a heavyset dude with facial hair and a skinny dude in a hoodie! This is how things work. I especially love the skinny dude’s reaction when Shawn throws the horns and lays out the deal. Beefy McShadesalot is still skeptical about some weird kids busting into his office with a sword, but this dude is totally with it. I’m not even going to post the scene where they summon Tyr. There are runes. 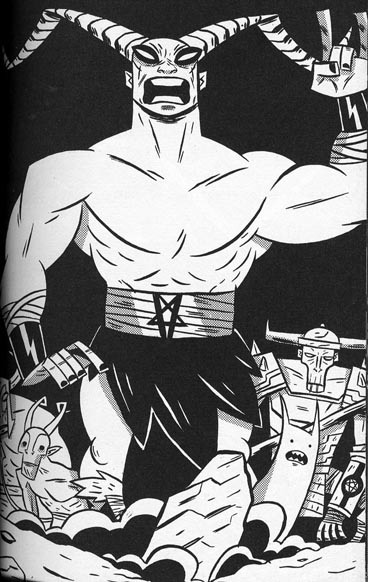 And Tyr gets pretty much the most badass entrance in the history of fiction. The way everyone talks in this book! 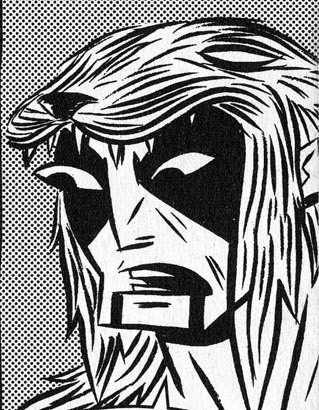 I totally threw the horns when I read that panel. Did I mention everyone in black metal goes by ridiculous stage names? Here are some lineups from my iTunes library. Mayhem: Maniac (vocals), Blasphemer (guitar), Necrobutcher (bass), Hellhammer (drums). Emperor: Ihsahn (guitar, keyboard, vocals), Samoth (guitar), Tchort (bass), Faust (drums). Cirith Gorgor: Nimroth (vocals), Astaroth Daemonum (guitar), Asmoday (guitar), Lord Mystic (bass), Levithmong (drums). Immortal: Abbath Doom Occulta (vocals, guitar), Iscariah (bass), Horgh (drums). That thing on Berserker’s head? Not his hair. A BEAR SKIN. He wears it for (almost) the entire book. 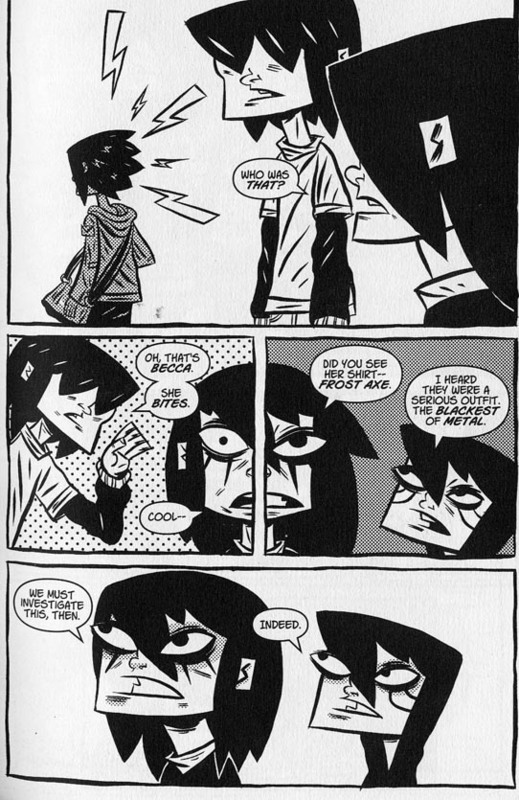 There’s a line from Scott Pilgrim’s Precious Little Life where Scott is desperately trying to carry a conversation with the girl of his dreams and not doing a very good job. She tells him bluntly, “You’re all over the place.” “But I’m so sincere!“ replies Scott. I will never be able to resist books that know themselves and love themselves, purely and honestly. This is a book that was created by love and joy, and it shows. Bring on volume II!